Do old spirits walk the grounds of El Panteon de Belen? Well, that I can't answer. I was not brave enough to take the guided "night tour." But maybe you will have the courage to visit this famous cemetery at nighttime. 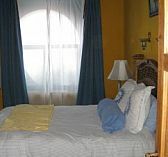 Speaking of tours visit my new addition the Mexico vacations in Guadalajara walking tour! If you're only in Guadalajara for just one day this is an absolute must do. Visit our new edition- Scary stories submitted by visitors. In the light of day, upon entering you immediately feel that it is a place of peace and full of many, many stories. I felt relaxed when I stepped past the main gate into the cool breezeway. The large green trees seem to beckon you with their leaves swaying in the wind to sit underneath. And every once in a while a pigeon will fly by, the sound of its flapping wings reminding you of something out of an old western movie. The cemetery is just beautiful, prepare to be amazed. From the well tended lawn, to the weathered, crumbling tombs and old graves, they seem to call out to you. There are so many stories in each one of them. They adorn many square feet of this historical cemetery. It is a tranquil, relaxing place and one you definitely shouldn't miss. 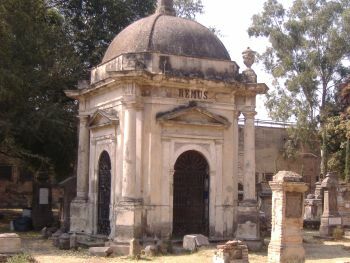 The Panteon de Belen once served as the cemetery for the Old Civil Hospital of Guadalajara. During the years 1785 and 1786 the city and surrounding area went through hard times. Unemployment, hunger and sickness enveloped the city and death rates were high due to plague. At the time, there were only two hospitals and they were soon overwhelmed with patients. Sadly, they were also quickly running out of room in the cemeteries due to the sheer numbers of deaths. 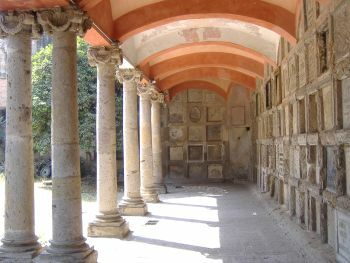 The idea to develop this now famous cemetery was envisioned by Fray Antonio Alcalde in September 1786, sadly, he later died in 1792. They were to construct the cemetery next to the Old Civil Hospital. The project was picked up and carried out by Bishop Diego Aranda and it was later finished in 1844 by talented Architect Manuel Gomez Ibarra. 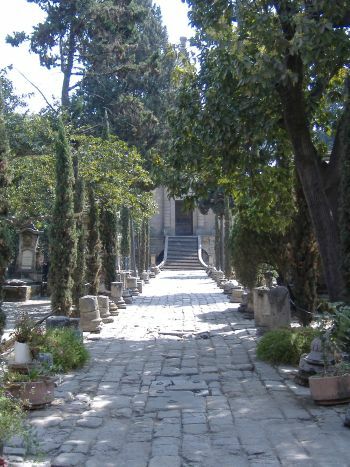 Little did he know that it would become such a famous cemetery in Guadalajara. He is also the same person who designed the Guadalajara Cathedral towers. It was previously divided into two sections called "patios." The first patio was for the wealthy, or those who could afford the fees. The second patio was for the poor and sadly this one was demolished in 1967 because most of the graves were unrecognizable. 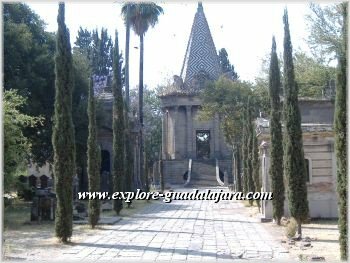 In the first patio, the wealthiest and most distinguished people of Guadalajara were buried underneath the Capilla de Vejacion. In the year 1947 some of the bodies of these distinguished gentleman who were buried there were excavated and moved to Rotunda de los Hombres Illustres located downtown. The Panteon de Belen was closed in October 1896 and has since been converted into a beautiful museum for everyone to enjoy. Guided tours during the day are free. Tours available in English if a large group (call ahead to schedule English tours). Hours and subject to change without notice. Please check back for updates.